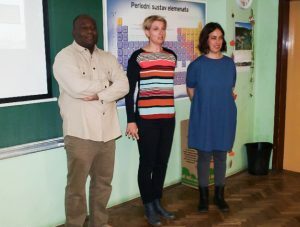 Students from the August Šenoa elementary school in Croatia are learning a lot about important food issues such as the concept of fair-trade and working conditions of people in developing countries. 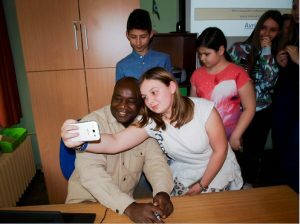 So, what could be better than an opportunity for students to direct questions regarding food issues to field expert Mr. Lassina from the distant African state Burkina Faso? In many schools, the collections for African states and poor people are organized. Students and teachers can, for example, donate clothes, school supplies, money, toys and other things they do not want anymore that someone else could appreciate. Typically, those who donate don’t know who will receive the items. All donation receipients remain anonymous. Similar donations are organized at the August Šenoa school. Children, parents and teachers could donate school supplies for kids in need in Burkina Faso. But, in this case, those who donated had the opportunity to see and talk to someone from Burkina Faso working in an NGO that distributes their donations and helps children. This allowed for those who donate to develop a greater understanding about living conditions in Burkina Faso and have greater empathy for those in need. The issue of child labor. Mr Lassina spoke mainly about life conditions in his country. Most of the local people have to work hard and still struggle, so the life of children in Burkina Faso is not as easy as life in Croatia or another European country. Their school is unfortunately not in good condition. Furthermore, children are often kidnapped or sold by their own relatives to work on plantations in neighboring countries. The Keoogo NGO, where Mr. Lassina works, takes care of abandoned and sick children. Mr. Lassina helps kids to avoid begging for money on the streets. He tries to collect money from various projects to enable young people to have their own land and livestock. This demonstrates a creative approach to addressing food-related issues in Burkina Faso. Thanks to Mr. Lassina, people can lead more self-sufficient lifestyles. Overall, students gained a better understanding of how important fair-trade and working conditions are. The children learned the realities of the food industry, and how food products we buy in supermarkets could be produced unfairly and even with the use of child labor. 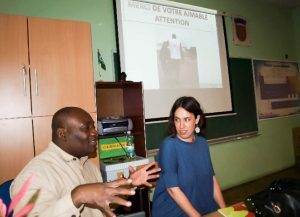 From Mr. Lassina’s visit, students better understood that the importance of thinking about food production when we by food. We should ask questions such as: Who produced this food? Were they paid fairly for theirwork? Could it be a child like me that has to work on plantation? Students from Osijek gained precious knowledge that they may carry with them thanks to Mr. Lassina’s lesson.